Amazing… I just wish I had the courage to crochet it. Seems like it would take a long, long, time. Katie, I thought so too, but mine is going surprisingly fast!! Give it a try! You’ll love it! What stitch did you use for the edging. My grandaughter will love this. also, do you have any fourth of july pin patterns? The edging is done on row 5 with single crochet. I LOVE THIS PATTERN! I did mine with multi-colored yarn for a little girl. It turned out beautifully! 🙂 Thanks so much! I’m going to be making a few of them for Christmas this year to give as gifts. I will suggest buying three skeins of yarn! 🙂 I used about 2 1/4 skeins of yarn! 🙂 Thanks again! This was an extremely simple pattern too! I love this scarf and I’m making several for holiday gifts! I haven’t crocheted in a long time, but want to do some scarves as gifts and this scarf looks perfect. Due to time being an issue, does anyone know approximately how long this scarf would take? I also have had issues with scarves in the past curling and not laying flat… I assume that won’t happen with the way this one is designed? Is it just a long chain and then treble stitches in each chain? Thank you!! Hi Sherri, it all depends on how fast you crochet. I made this scarf a while ago, but I’m going to guess it took me about 2 hours. And yes, you shouldn’t have to worry about curling, since it is suppose to curl. It is a long chain, with treble crochets in it. The number of trebles will increase for each row in the pattern. So I haven’t crocheted in forever and I am trying to remember how to read patterns. Is it as I understand it that I make one long chain then go back, skip 3 chains in the beginning and then do a treble stitch in each individual chain or do I skip 3 chains in between each treble stitch? And then the 2-4 rows are 2 treble stitches through each individual chain? Is row 5 single chains across the treble stitches and I could do the different colored trim here? Hi Sherri, yes you are correct, at the beginning you skip the 3 chains then treble in each of the chains across. And you are correct with your other assumptions. Here is a tutorial on How to Read Crochet Patterns, if you need it as reference. This is a darling pattern. I can’t wait to crochet it. Thanks for the helps page. I want to try to crochet a scarf for the special olympicsscarf collection. That site had a link to your site. I am sooo new to this, but think I get the “jist” of it, but, I am confused at the simplest of things. 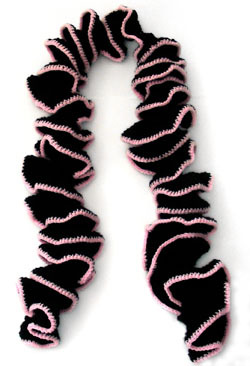 In this ruffled scarf, it says to “turn” it…turn it how? See…told you. Also, the yarn is pink and black and is “one” yarn as opposed to two separate colors? Thanks sooo much. I am learning a ton from you and your website! Hi Trish! “turn” means to turn your work so that you can make the next row. Once you finish a row, you are at the end of the row, so you’ll have to turn it 180 degrees so that you can make your new row on top of your previous row. The Scarf in the photo is make with black yarn and the last row in the pattern is made with pink. You can use any color you want and change colors anytime you want to get the look you prefer. i am new to this but i really like the pattern! When you say “2tr in each tr across” what does that mean? in each hole? So on each row there would be double the number of tr? And is it in the space between the trs on the previous row or IN the trs from the previous row? sorry if this dosent make sense. thanks so much! ok thank you, so then on the 3rd row will there be twice as many as on the 2nd row or do the same on all of them after that? Yes, for rounds 2 – 4 the number of tr will double each time. This scarf looks awesome! I’m going to try it after I finish my current project (another scarf….I’m just starting out) but was wondering approximately how many yards of yarn it will take? Any idea on how many yards this scarf requires? Thanks. Hi Lucy! It uses approximately 300 yards of yarn. Oh I like it, thanks. I just learned to crochet at the beginning of October and saw this pattern and loved it! I love super long scarves, so I started mine with 315 chains and it ended up being 74 inches long. I used about 730 yards. Thanks for the pattern! It is super cute!! hi! i really want to make a ruffly scarf but i was wondering if theres any way to make it less curly and just slightly ruffled? Hi Jenny, row 2 – 4 is what makes it super ruffly, because it doubles the number of stitches on each row. So to make it less ruffly, working row 2 as the instructions state, then for rows 3 and 4, do a tr in each tr across. This will stop you from adding more and more treble stitches, because the more you increase the number of stitches, the more ruffly it will be. Hello! Thank you for the great pattern! I just wanted to clarify, with the 2 tr…is it correct that you complete the tr and do an entire new tr in the same stitch? So it is different than a 2 dc because you complete each stitch instead of combining them right? Thanks, sorry for the simple question but I’m new and learning! Hi Sarah, yes you are making 2 treble stitches into one stitch. It is the same idea as making 2 dc, but here you are using the treble stitch. Thank you! I can’t wait for this scarf to be done, it will be my first real scarf! I LOVE this scarf! My grandmother taught me how to crochet a bit when I was a young girl. I haven’t touched any in years but I have just had a hysterectomy and need something to do besides watch TV or surf the web. I searched for a simple pattern and this is one of the first ones that came up. It’s super girly (which I love) and with all of your direction and advice, I think I can do it! I am sooo excited to get started! My hook is on the way! I’ll let you know how it turns out. You give great instructions, by the way. I don’t think I’ve ever seen it written out in a way that was so easy to understand! One question, what is the yarn needle for? I don’t see any instructions for using it. Whoops, don’t know how that got in there. Thanks for pointing that out Lisa. You don’t really need a yarn needle, but it is often used to weave the ends of the yarn into your work after you are done. I have been crocheting off and on for about 15 years. I was working on a ripple pattern at work, when we had a huge snow storm that came about really quickly (nobody was expecting it). I had left over baby yarn that I needed to use, so made this. It took me about 4 hours (counting stopping to wait on customers) it kept me occupied since we have to stay open. Turned out beautiful. I will be making more in the future, just started on my second one of the day for one of my employees. Pics will be posted on my FB page (Jennifer Keenan), my photos are not private, so check them out and add me if you want. Have a great Christmas everyone! I guess I’m still confused about rows 2-4. So do I do a tr through each loop 2 times? I know I’m suppose to take my needle through both the front and the back loops….so then I do a tr and then take my needle back through those same loops and do a tr again? or does 2tr just mean that we are taking the needle through the front and back loops? Make sense? I am just getting confused because you say you double on each row for 2-4….soooo confused. But I’m coming along. I am ready to start row 2…it’s taken me 2 days to get to that point but….I’m there!!! LOL! Yes April, 2 tr means you will make 2 treble crochet stitches into the stitch. Since you will make 2 tr in each tr across the row, then you will have 2 times as make tr on this row than on the previous row. I hope that makes sense! Thanks so much for your help….I am now turning to do row 3. I just read that you did this in about 2 hours….I’m now on DAY 3…LOL!!! Thanks so much for this great pattern and for helping a newbie!! I just finished this scarf using a more bulky yarn and a larger crochet hook, I started with 120 chains (I think) and used varigated color grey yarn It came out very beautiful and warm. Please advise on how many chains I should start with to make this scarf for a 5 year old child using worsted weight yarn. Thanks very much. Hi Barbara, you can probably do 150 chains for a child, which is 3/4 the size of the adult scarf or you can also make a chain approximately the length of the scarf you desire. I just finished the scarf and it is great!! My cousin is going to love it. I think I crocheted it to loose. It is long! I used 1 1/2 6oz skeins. I am making another now but shorting it up for my Aunt. oh sorry. guess someone asked that already. will have to look up how to do that. Thanks! Thanks sharing your pattern! I made 4 of these scarves for Christmas presents and everyone loved them! I’m on row 2 now and it is looking so nice! I’m so thankful for a pattern even I could read! I saw this pattern and ran right out to get the yarn the same day. I finished it in a few days and love it! I chose to do a purple trim. I may try a lighter yarn to wear this scarf as an accessory rather than to keep me warm. I’m making one for a friend now. I am so glad I found this site. I was about to spend 50 dollars at a chain fabric store to brush up on my crocheting. I have larned so much from this site and have used the money to buy new yarn. I will start on this scarf for my daughter. This scarf is beautiful. What brand of yarn did you use? I would like to make one for me and my daughters. Thank you. Hi Tameka, I think I used Caron yarn for this scarf, but it was such a long time ago I can’t be 100% sure. Either way, you can use any medium weight yarn that you like. It doesn’t have to be what I used. Have fun crocheting your scarf! Hi Jennifer, yes it is just 5 rows. That is the width of the scarf. Plus it will be super ruffle when you’re done. Have fun crocheting! I’m not clear with the pattern. Are you saying for Row 1 to put 1 tr in EACH of the 203 ch? And, for Rows 2 -4 put 2 tr in each tr? I’m clear on Row 5 – 1 sc in each tr. Hi Jackie, for row 1, you will start with the third ch from your hook and place 1 tr in each of the chains across the row. Then on row 2 – 4 you are making 2 tr in each of the tr across the row. I too am just learning, the question I have is when I start the second row, do I start the tr stitch in the first chain after I chain my 3? I guess I should know this, but I am not sure. Hi Debbie, on the second row, you’re going to make your first tr into the first tr on the row, not the chain stitch. Let me know if you need more help. thanks for the help!! I finished in a matter of hours..I shortened a bit, but turned out great! I did a brighter pink for the edge and “petal pink” inside as I am making a bunch for my daughters fundraiser for the Y- Me Race ( for Breast Cancer ) in Chicago on May 8th. Of all the patterns I am learning to do this truly was the easiest!!! thanks for the help!! I finished in a matter of hours..I shortened a bit, but turned out great! I did a brighter pink for the edge and “petal pink” inside as I am making a bunch for my daughters fundraiser for the Y- Me Race ( for Breast Cancer ) in Chicago on May 8th. Of all the patterns I am learning to do this truly was the easiest! Hi! This is my first attempt at a crocheted scarf and it’s turning out really well! My question is, will I need an extra skein of yarn? I’d like to do the full pattern, but I don’t want to have to buy another skein of this same yarn (especially if I’m not going to use it all). Just curious if I should cut down the rows to stick with the one skein that I have. Hi Jenna, depending on how big your skein is you may need another skein of yarn. I can’t tell you for certain, but I used approximately 300 yards of yarn to make this scarf. It’s always good to have extra than to not have enough. Plus, if you have extra there are a bunch of small patterns here on Crochet Spot that you can try using your leftovers! something for eveing wear. What adjustments to the pattern would I have to make. Great pattern. Denise, you can simple use a lighter weight yarn and follow the pattern as is. I saw a color I REALLY loved and decided to make this scarf. It only came in 120 yard skeins though. I’m on my 3rd one and my mom says it looks like I’ll need another. Above you said you only used 300 yards so I want to make sure I’m doing it right. Rows 2-3-4 all need to do is put 2 triple/treble stitches in each one right? it is looking rufflish, but not really like the above pic. Hi Summer, that is correct. I did crochet pretty tight when I made mine, so that might be why I used less yarn. Hi, my daughter’s just love this scarf and so do I! I am attempting to create it and finished row 1 now I am ready to go to row 2. Please keep in mind I am an absolute beginner with crochet with that being said, I am not sure how to tr in the tr. Would I start at the bottom of the chain or am I starting under that which I am thinking is the bottom of the tr?